Full Of Sith T-Shirt Pre-Order! BY POPULAR DEMAND! A Great Sithmas Gift! Here you see the most amazing t-shirt this side of the galaxy. Show your support of one of your favorite podcasts everywhere you go. This is a one of a kind, limited edition t-shirt, get one before they disappear forver! a FREE Full Of Sith vinyl sticker created by Mike Pilot Design. Once pre-order ends, your t-shirt will be created just for you and shipped promptly. Available in SMALL through 4XL. tablet, laptop,walls or anywhere else, Mike Pilot Design has you covered. Super Heros, Dr. Who, Game Of Thrones and so much more! Custom stickers are certainly also available. 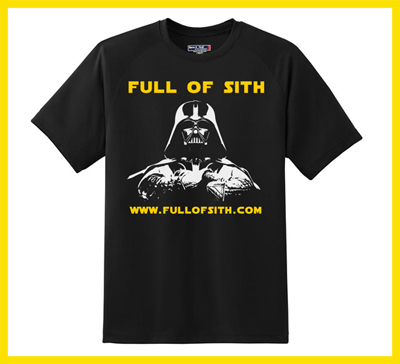 mention the promo code “Full Of Sith” for 20% Off. How much are they brother?